My one word for 2012 was JOY. I sought to see joy in the everyday things, and to be joy. A challenge to myself to recognize that being joyful is a choice and that my choice affects others. I truly feel that I was able to do this far better this past year. I counted things to be joyful about, I had a banner in my house that said "eucharisteo" life-filling gratitude – the practice of which is exercised in recording blessings, one by one. and I even got a sign from my friend Keri that says JOY to put up in our house. But the heart...that's where it really matters. We can spray our "word" all over and talk about it all we want, but unless we allow it to sink in and be a part of us, it doesn't matter. I will continue to count my blessings and allow JOY to be a part of who I am everyday. For 2013 I have chosen the word CHANGE. That word scares a lot of people, most people aren't comfortable with change and I am usually one of them. I'm learning that change is good and change is necessary. I want to embrace change, to be ready for change and to cause some change. Physically, spiritually, mentally, tangibly....change. I want to change the way I feel about myself, and I want to change my physical appearance losing weight and getting fit. I want to change how I view my days, my challenges my life. I want to change how I react and respond to people, and I want to be in continual change when it comes to my relationship with Christ, never wanting to grow stagnant thinking "I've learned all I can". I want to press others to change, to break out of comfort zones and to stir the pot. To make sure I hold myself accountable, each month I will be linking up with the fabulous Melanie over at Only a Breath (she's also the one who designed my awesome One Word button!) on the 15th. I will update how my "one word" challenge is going, either something we've done or a heart change, physical or otherwise....little or big, it's going to be blogged. The 15th of every month. What about you? Did you pick a word for 2013? LOVE your word!! Change is something I can struggle with at times. I am announcing my word on Thursday! Love your word, too! I didn't do a One Word last year, but change would have been it. This year my word is NEW. After a year of unexpected, unwanted, and unimagined change, I'm ready to move forward to discover the new me and the new life God has in store for me. My word for 2013: AWKWARD. :) And I'm totally serious. I love that word...what a good choice! I chose peace for mine :) I'm glad we're gonna be held accountable and have to link up and say how we're doing, because I surely could use a little bit of peace in my life!! I chose the word "lead" because I feel the Lord asking me to step up in my unintentional leadership... and to become more intentional in it. Joy is my word for this year, we started a joy journal in the 1st to add to throughout the year and I encouraged a few friends to join our family in the journey by giving them One Thousand Gifts and a joy journal too! I sense some changes here, too. Great choice! Speaking of some changes, your guys have grown so much since the last time I 'visited" here. They are cute! "We can spray our "word" all over and talk about it all we want, but unless we allow it to sink in and be a part of us, it doesn't matter." Wow. How 100% true. I hope to remember the every day of this year. What an amazing and yes, scary word. I'm looking forward to seeing all your change. 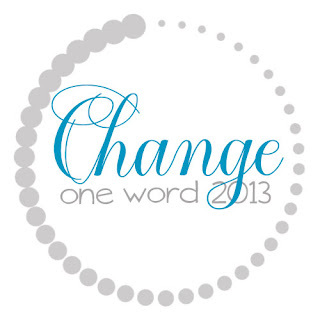 My word this year is change too! I have 2 boys and plan to follow your journey this year since we're doing the same word!! Yeah! Change! I'm normally terrified of change but getting better. You, on the other hand, are a great role model and I'm looking forward to seeing the change that God will bring in your lives as a result of your wide-open hands!